It’s on! The Surf n Sea Pipeline Womens Pro in improving 4-6′ Pipe’s new NW building to 8′ late today! Pipeline can be a crazy wave, get ready for the action. 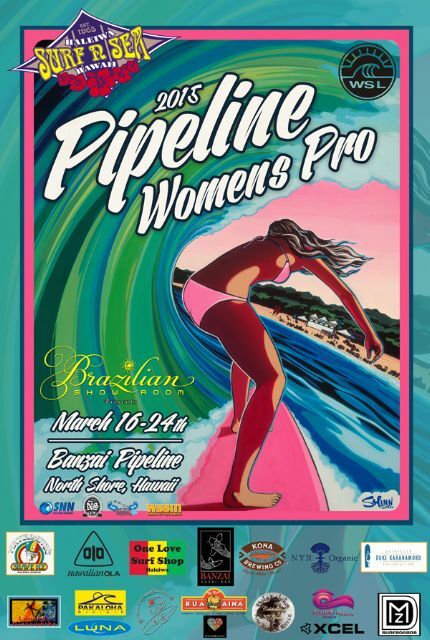 The Surf n Sea Pipeline Womens Pro presented by Brazilian Show Room has a long history of events at Pipeline starting in 1980 when only the Women Bodyboarders were taking on the challenge. At the time there were organized Women’s groups working at it and big world tour events in other countries. As Women’s short boarding grew there came the day when they wanted to have a contest at the world famous spot. It was on! The first events were held with many styles of board riding including SUP. This year’s contest will be the short boarders only battling it out for points, a bit of prize money and hugh bragging rights! Pipeline is a place of consequence and the women that ride it are a different breed. The pool of athletes these days is deep and we wish them all good luck!. Thanks to all of the support especially Brazilian Show Room the presenting sponsor for the opportunity to showcase the Women who would not miss it for the world. The Surf n Sea Pipeline Womens Pro presented by Brazilian Show Room congratulates Surf n Sea as they are celebrating 50 years of service to our community. Surf n Sea is a destination that ensures you have the best of Hawaii’s ocean experiences and shopping! They have been in the rustic two story building since 1965. The presenting sponsor, Brazilian Show Room is located in Haleiwa and Kailua. They specialize in the best Brazilian products brought straight from Brazil to Hawaii. They carry top designers and are always ready to service you with the upmost care. Check out their web site at http://brazilianshowroomhawaii.com. Official Drink: Local and Kona, Hawaii based Hawaiian Ola is an organic food and beverage company offering healthy, functional packaged goods to retailers, smoothie bars, and sport shops wherever they are needed. The company was established in 2012 and has since released many great products. Ola products are certified organic by the USDA, certified vegan, certified fairtrade, gluten free, and packaged BPA free. Find them at www.hawaiianola.com. Official Beauty Product: NYR Organic, Neal’s Yard Remedies, started life in a small depot in central London, driven by the passionate belief that health and beauty should be more natural and less synthetic. Today they have many products that are distributed around the world. They are passionate about transforming people’s lives, educating and empowering you on how to live more healthily through the power of nature. The local number to call is 808-537-3933 and find Kim at us.nyrorganic.com/shop/kimhouston. Poster Surfer: Emilia Perry, just call her “Meals” for short, has been an extra avid surfer at Pipeline for over 15 years and her passion continues to grow. She is also a professional mermaid and teaches surfing on Oahu’s North Shore. ” I want girls to know that you can do anything”, she says.” Mermaids have more fun!” Perry will once again be a competitor in the competition and is one of the stand outs at every session! Surfboard Designers: Jen Miles and DMZ Surfboards have put their planers in gear to build two great surfboards for the contestants. Miles in her own right is a great surfer who has the passion for designing boards and has created other surfing events in the past. The gang at DMZ designed a beautiful board for the wahine. DMZ is all the way from California to hui in so Mahalo!! Official Forecaster: Surf News Network in business sharing surf heights and conditions for over 30 years. Call 808-596-7873 for daily updates at 7am. Log in to see the SNN surf cameras at http://www.surfnewsnetwork.com.